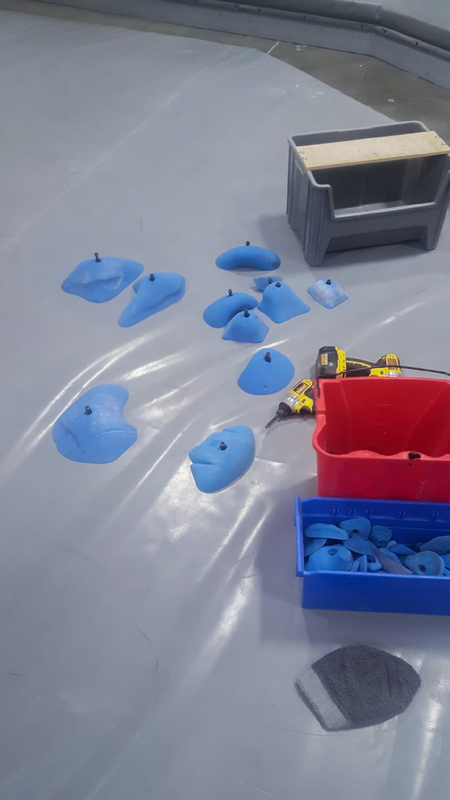 Ever wondered what goes on behind the scenes of that route or problem you love to send at your climbing gym? I did, which is why I recently sat down with a few route setters from The Rock Boxx and Western Oregon University’s climbing wall and talked to them about what it takes to set a climbing route. And it isn’t easy; these route setters work hard to make sure what they set is fun, climbable, and enjoyable for climbers of all skill levels. Here is a little peek into route setting and the work that goes into it. Enjoy. In North America most routes and problems, set either inside a gym or at a crag outside, are graded by two different systems: the Yosemite Decimal Rating System (YDRS) and the Hueco Scale (also referred to as the V Scale). These two systems categorize routes based on technical and physical moves the climber must make during the climb. With the YDRS, a system used for sport and trad climbing, the routes are rated from 5.0-5.15, where the Hueco Scale, used to grade bouldering problems, goes from V0 – V16. Of course these ratings can expand as climbers continue to push boundaries and explore the realms of the sport; V17 has already been proposed but is yet to be confirmed. The higher the climbing grade, the harder the climb becomes. For example, a 5.8 utilizes holds such as large jugs and pockets – holds that are easy to grab and hold on to. A route rated at 5.11, however, will see holds like crimps and pinches and slopers, and will demand good technique and a high sense of body awareness from the climber. Route setting is a complicated process for many reasons: which holds to use, what grade the route will be set at, which area of the wall to set on, and how the route will look going up or across. Is there a section of the wall that contains more features? If so, how does that affect the holds you want to use? Are there overhangs? How will that affect the grade being set? These are just some of the questions setters have to consider before actually setting. Another aspect of setting that makes it tricky is how subjective the grading system is. For example, Daniel Struble, a climber who used to set at WOU, said, “Many gyms in the US use YDS and/or Hueco systems, but many use their own systems, like The Rock Boxx, and some don’t use any rating systems at all: U of O’s bouldering area, for example. These tend to encourage people to climb on things they wouldn’t otherwise try because they got scared off by the numbers.” Katie Nance, another setter at WOU, said there is a disparity between climbing a 5.10 at Western’s wall vs. climbing a 5.10 at Planet Granite or Portland Rock Gym. Furthermore, when I climb a 4 at The Rock Boxx, which does not use the V Scale, just a system related to it, it feels like a V3 at WOU. These differences do not take away from the legitimacy of the routes, however; it is just one more obstacle for a route setter. The process of a route being set depends entirely on the person who is setting it. Zander Albertson, who has set at Western Oregon University, says he usually has an idea of what he wants to do while still on the ground. These ideas can be anywhere from the need to set a certain grade, a crux idea (the hardest section of the route) that he sets first then builds the rest of the route around, to a theme, such as crimps, slopers, pinches, etc. Jon Snyder, a setter from The Rock Boxx, says “it varies quite a bit for me. Sometimes I find a group of holds that I think would be fun to use together. 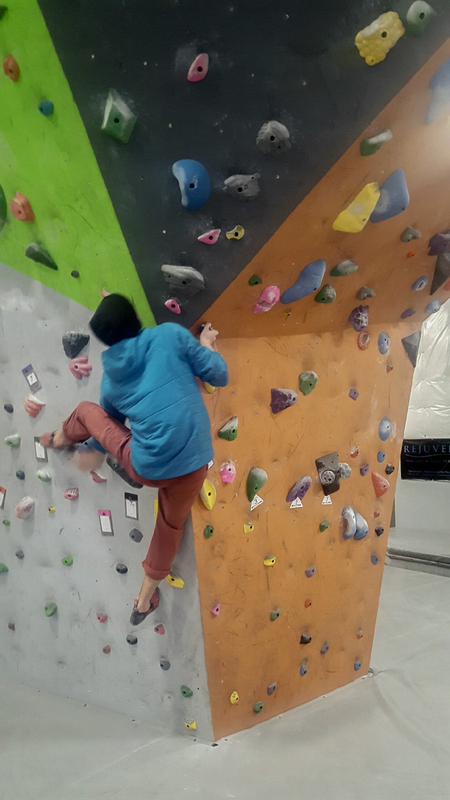 Other times I have an idea for a string of moves and then have to find the holds that make that possible.” He added too that some of his inspiration for routes comes from climbing outside and seeing movements he thought were interesting. I visited Snyder and Jon Chayse, another setter at The Rock Boxx, when they were setting a 5 with moves inspired from a problem at Smith Rock. The first thing they did was lay out all of the holds they were going to use, which in this case were all slopers, a hold that is smooth and requires an open-hand grip (think of holding the round side of a bowl). 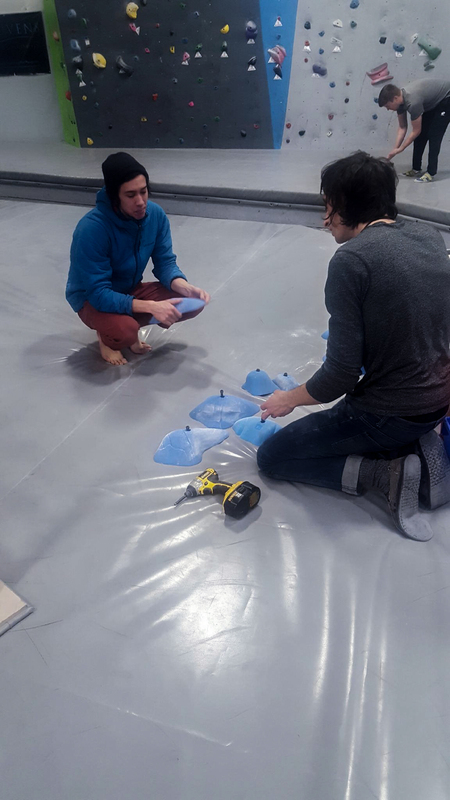 As they set up, they explained to me that their gym tries to set holds that are consistent with one another so it flows better. Not all gyms are like that but at The Rock Boxx it helps to create a unique, congruous style throughout. Prior to writing this blog I didn’t realize all that went into setting a route. It’s impressive, the work and knowledge of climbing a setter must have. None of route setting sounds easy and next time I see a setter I will most definitely be thanking them. Johnston said that route setting is artistic and I think she’s right: there’s a certain art that comes with it; much like a painter takes a blank canvas and produces something beautiful, a route setter sees a blank piece of wall and utilizes it to construct something that, when climbed, can have the ability to look like a dance.